Sealing travertine, marble, granite and limestone is a CINCH with this exceptional product! It's a below the surface impregnator sealer that repels BOTH oil AND water. FORGET the power tools, harsh chemicals, strippers, sanders & pages of instructions. STOP applying sealers weekly, monthly & yearly! Just grab a clean white rag and the sealer. Pour it on, let it absorb in (3 to 4 minutes), then wipe up any excess sealer. Use it on a plethora of different surfaces & finishes! This water based baby works on ALL natural stone, grout, terracotta, concrete and ANY other kind of porous mineral and man made material. Honed floors - no problem! Glossy finish? Soaks right in! Sealing granite countertops? Every TEN YEARS! Bathroom vanity? This is the BEST sealer for the job! Because it sits just beneath the surface of your stone, this water and oil repellant sealer STOPS staining agents in their tracks! Look at the picture above. Oil and water based staining agents sit on top of your stone patiently waiting for you to wipe them up. If your stones not sealed and you don't wipe them up quick enough, a stain is born. 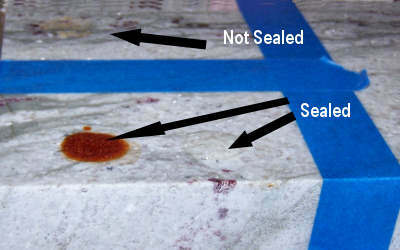 This sealer will NOT change the color or the look of your stone. Here's what happens: It soaks in. The water evaporates. The resins expand. Depending on your stones porosity, one quart covers approximately 200 square feet. Stop Worrying & Wasting Time! Whether you're sealing your granite countertops or sealing your stone floors, this is the sealer you want! It's easy to to apply and safer to handle as well as safer for the environment. Here's where you'll find the Easy To Use Stone Sealer. I am soooo pleased with your granite care products! 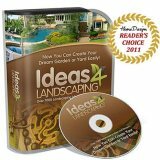 I used the sealer and it is great!